Bridgestone uses its worldwide knowledge base and 80 years of rubber research and development to create fenders of uncompromising quality. Bridgestone is proud of its supply history and reputation within the industry. Bridgestone marine fenders have not only excelled in laboratory tests, but also stood the test against actual berthing operation in ports all over the world. The Hyper Cell fender is the highest evolution of the original Bridgestone cell series fenders introduced in 1969. Analytically designed, Hyper Cell fenders have a very complex shape, making the energy absorption and reaction force ratio effectively higher than Super Cell fenders of the same size. Advanced materials, cutting-edge technology and advanced testing facilities play a pivotal role in the success of the Hyper Cell fender. Since 1996, Hyper Cell fenders have been in service at ports around the world. Specifically, Hyper Cell fenders are very popular at container terminals due to their durability and performance. Similar to Super Cell fenders, Hyper Cell fenders are typically designed with frontal frame to allow for better distribution of stress across the hull surface. 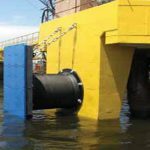 50 years of experience in fendering solutions has been incorporated into this latest generation of fenders. Originating from the cell series fenders first introduced in 1969, Bridgestone Super Cell fenders have stood the test of time. 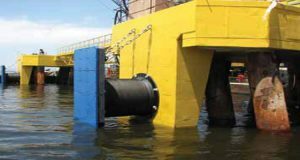 Thousands of Super Cell fenders have been in service at ports in more than 50 countries, greatly contributing to the economical design of marine facilities. From the smallest SUC400H to the world’s largest fender the SUC3000H, Super Cell fenders meet almost all fendering needs at ports around the world. Bridgestone Super Cell fenders are unique, having a high energy absorption to reaction force ratio as one of its salient features. They are cylindrical in shape with two steel mounting plates firmly bonded to both ends of the main rubber column during vulcanization. The fender performance is developed by compression and column buckling. 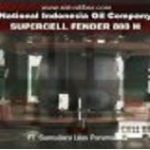 Super Cell fenders are typically fitted with frontal frame to allow wider contact area with the vessel, thus reducing pressure against the vessel hull. Dyna Arch fender was first introduced in 1984. This V type fender offers higher performance than the prior Bridgestone V type fenders including Super M and Super Arch fenders. Dyna Arch fenders are particularly suitable for small harbour. Its unique application utilizes both the assembly of frontal pads and frontal frame. The Dyna Arch fenders are available in three (3) types to enable port owner or engineer to make the most suitable selection.